Volcan Barú National Park - is in Panama's northern most region. The park is 35,000 acres/14,325 hectares in size, and Panama's highest peak at 11,401 feet/3,475 meters. The Volcano has been dormant for over 600 years; but with the bubbling Hot Springs and frequent seismic activity, it might not be entirely extinct. You can climb the Baru from the Boquete side, which is an all day event; or you can camp overnight near the ranger station, and watch the sunrise. Dress in layers, as the higher you go, temperatures will change dramatically. The famous Sendero de los Quetzales Trail(Quetzal Trail)passes through the lower slopes of the Volcan Baru. 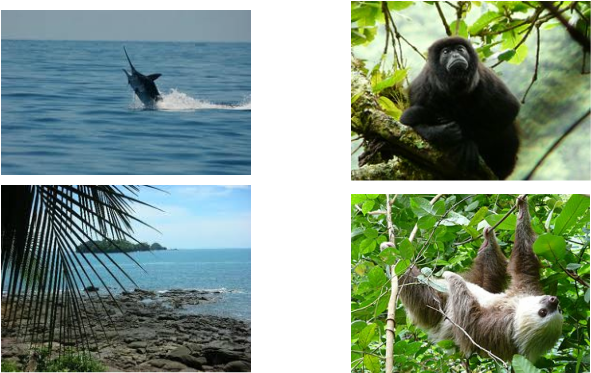 Parque Nacional Marino Golfo de Chiriquí - in the Gulf of Chiriqui and has some of the best whale watching in the region. Coiba National Marine Park - frequently referred to as the Galapagos Islands of Central America for its abundance of rare species in both the water and on land, Coiba National Marine Park is composed of the island of Coiba and 37 surrounding islands and islets, all of which are about 30 miles off the Panamanian coast. Here you can scuba and snorkel and see some of the most rare pelagic species of marine life in the world. Gulf of Chiriquí - Much of Panamá’s best lie in the Pacific Ocean’s Gulf of Chiriquí. Numerous archipelagos star the gulf with islands and reefs, including Central America’s largest island, Coiba Island. This area is home to the richest mangroves and rarest pelagic marine species in the world. Lonely Planet Panamá calls the Gulf an undisputed gem. It has a reputation as a world-class sport fishing destination, as evidenced by Saltwater Fisherman Magazine, which named it the best place in the world for catching the Black Marlin in their April 2009 issue. The Moon handbook on Panamá says the Gulf of Chiriquí is so large and species-rich some consider it a small sea. Well known among insiders for its boating, sport fishing, surfing, scuba diving and snorkeling opportunities, the unspoiled and largely undiscovered coastal and marine environments in the area rival the best on the Pacific coasts of Central America and Mexico. Boca Chica - Located 32 miles from David is the main jumping off point for the islands in the Gulf of Chiriquí, including Boca Brava and Isla Palenque. Boca Chica sits on the Pacific coast just North West of the islands that make up Parque Nacional Marino Golfo de Chiriquí. Long a little fishing village, Boca Chica moves to a slow tempo, housing tourists and big game fishermen in a few quaint, family-owned inns, including Gone Fishing Panamá and Seagull Cove Lodge. A short boat ride away lies Cala Mia, which offers 11 bungalows on Boca Brava. Just past Boca Brava is Isla Palenque, where a boutique eco-resort development plans to break ground early next year. Parque Nacional Marino Golfo de Chiriquí - The PNMGC consists of the archipelago of islands just twelve miles south of Boca Chica, including the main island, Isla Parida. Established in 1994, the park is known for its green iguanas, humpback whales, hammerhead sharks, dolphins, multiple species of sea turtles and giant rays. Several tours visit the islands from resorts and tour companies. There is Lodging available at the upscale Propiedad de Paradise Lodge on Parida, but most travelers stay on Boca Brava or Boca Chica.